Rajasthan Board of Secondary Education (RBSE) successfully conducted 8th Class examination in the month of March 2017. About 11.72 lakh candidates appeared for the Mathematics, Social Science, Science and three languages including English, and Hindi 8th Class exam. All the students who had written the Rajasthan Board 8th Class exam are eagerly waiting for the results. Now, the wait is over. RBSE declared Ajmer 8th Results. Students can check the results from the direct link provided below. This year it has conducted the 8th class exam and the candidates who had appeared for the exam can check the results from the official website. 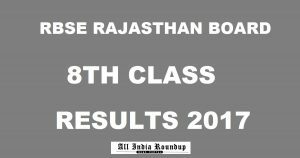 RBSE declared Rajasthan Board 8th Class Results 2017. Candidates who had appeared for the exam in the month of March can check RBSE 8th Results here now. How to Check Rajasthan Board 8th Results 2017? Click on RBSE 8th Results.